innovative ways of teaching and learning in order to achieve sustainable entrepreneurial education, promotion of sustainability-driven enterprises, and stronger collaboration between universities and companies. university teachers and business partners to acquire competencies for sustainability-driven entrepreneurship. The CASE knowledge platform provides inspiring good practices and tools for collaboration between universities and partners from business and civil society. 9 short videos about the key results of the knowledge alliance. Get inspired and learn about the purpose of cooperation formats such as service learning or the CASE Sustainability Performance and Competencies Tool. 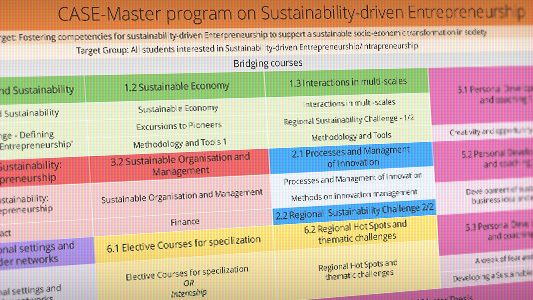 the curriculum of a new Joint Master Program on “Sustainability-Driven Entrepreneurship” available online. Find out more about 16 modules and the corresponding pedagogical framework of the master program. The CASE Knowledge Alliance between 10 partners from 5 European countries was funded from 2015-2017 by Erasmus Plus. CASE strives for sustainable socio-economic development and fosters cooperation between higher education and business through testing and developing new methods and tools supporting sustainability-driven entrepreneurship in higher education. The CASE Sustainability Competencies Tool makes individual competencies for sustainable development visible and gives support to further development. Assessment of values, knowledge and ability to implement is based on a holistic understanding of competence. It can be used as support for self-evaluation as well as for feedback processes in peer-groups, with coaches or teachers. Based on twenty-one university courses we tested and evaluated nine innovative cooperation formats that address topics and methods important to foster competencies for sustainability-driven entrepreneurship. The practical cooperation guide features these nine cooperation formats and highlights concrete benefits, success factors and challenges for users. We have developed the Sustainability Performance and Sustainability Competencies Tool and other material to support implementation of straightforward university-business cooperation. They all promote continous self-reflection about project experiences and foster dialouge and feedback processes. The CASE knowledge alliance developed the framework and basic elements of a new Joint Master Program on “Sustainability-Driven Entrepreneurship” for European universities. The framework is based on six thematic blocks and sixteen related modules. The structure of every single module is aiming at acquirement of skills and competencies via using inter- and transdisciplinary methods and tools in teaching and learning, focusing university business cooperation and project work and implementation aiming at entrepreneurial education and founding new sustainability-driven enterprises.